Slovakia outperforms most other EU members in terms of the percentage of adults involved in starting a new business (9.6%). In addition, there has been a recent increase in those businesses started out of opportunity (68.4%) while almost a quarter of adults perceive good opportunities to start a business. Another positive is that the rate of entrepreneurial intentions among those not currently running a business has increased to 15.7%, after a three-year decline with a low of 10.6% in 2013. Since attitudes toward entrepreneurship have remained generally stable, one could attribute this reversal to increasingly positive views of the prevailing entrepreneurial ecosystem conditions. However, Slovakia’s entrepreneurship ecosystem still faces a number of challenges – including inadequate transfer of research and development (R&D) and a lack of entrepreneurship skills development in the education system. A 2013 report also revealed that more SMEs in Slovakia struggle to access finance than those in other EU countries. The Slovak Business Agency offers specialised support to start-ups through a programme called Start-up Sharks launched in 2015. The initiative helps entrepreneurs that have been running a small business for less than three years to develop innovative and competitive business ideas. It also helps back IT businesses that are in their first year of start-up. The programme also offers support through Start-up Pool which provides specific information and practical help, including training courses and webinars on starting a business. The agency provides individual counselling and support by professional experts, mentors and lecturers and helps entrepreneurs to take part in international start-up events (by covering transportation, accommodation, and entrance to business events for a start-up and up to three of their representatives). Start-ups can also apply for international internships (3 weeks up to 3 months) in one of the world’s leading start-up centres. This programme gives an opportunity to learn how business works abroad as well as to build a useful network of contacts. In 2015 the agency ran a Start-up Sharks roadshow with lectures from international speakers which reached nearly 1,000 students and offered personal consulting for start-ups. The initiative is one of a number started by the government and private sector in the last five to seven years to assist the growing number of Slovak start-ups, many of them developing apps or providing hardware, equipment and e-commerce, according to KPMG’s Start-up Survey 2014. The Slovak government also plans to support innovative entrepreneurs to the tune of 18 million euros between 2016 and 2018. This includes new funds to assist fast growing companies with risk capital. Slovakia had a relatively high early-stage entrepreneurial activity (TEA) in 2016. However, this high early-stage entrepreneurial activity was achieved in 2016 mainly because of the high entrepreneurial activity of nascent entrepreneurs (up to 3 months). Even though in 2016 there was a slight increase in the established entrepreneurial activity. In 2016, there had been a long-standing high rate of business discontinuation. In the period under review 11,3 % of men and 7,6 % of women were involved in the early-stage entrepreneurial activity and in Slovakia. 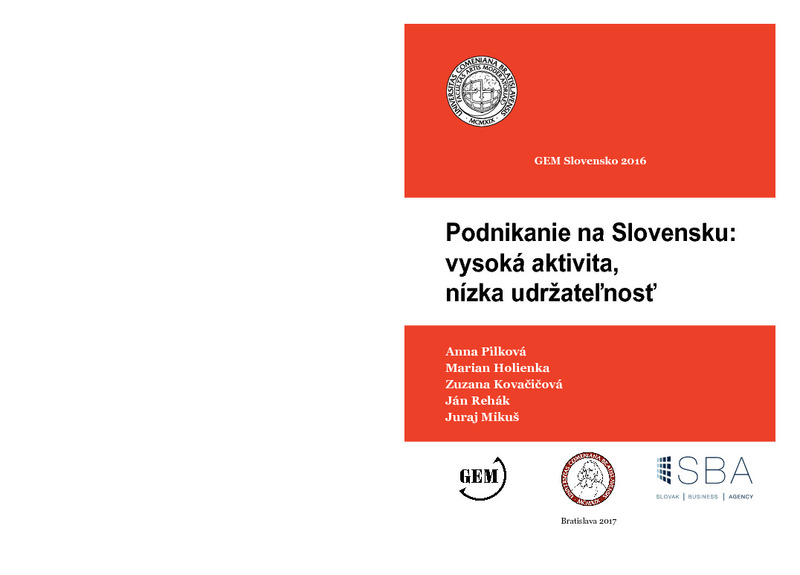 Enrepreneurial activity in Slovakia, analyzed from a five-year period 2011 - 2015, has its specifics compared to the key benchmarks (Visegrad 5 countries, Europe, innovation driven countries and GEM participating countries). GEM Slovakia 2012: Above-average Entrepreneurial Activity, Below-average Entrepreneurial Environment. Executive Summary in English (pp. 27-38). 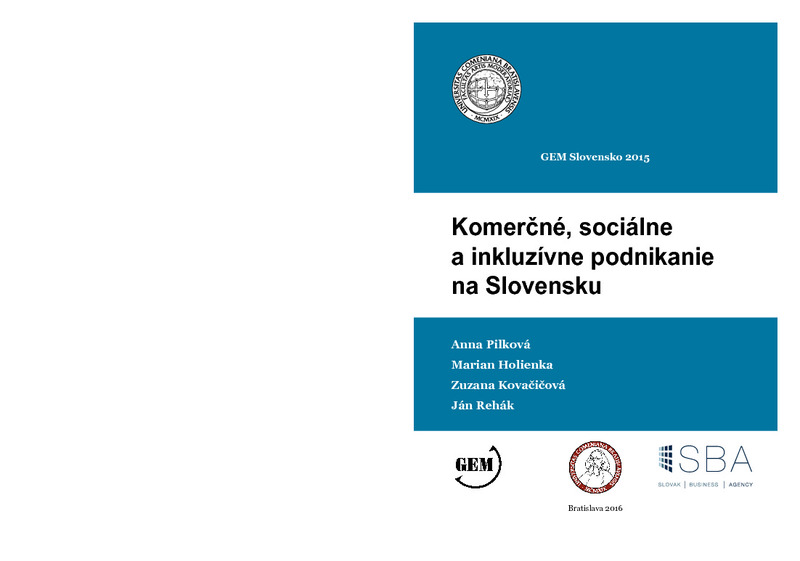 Our analysis of GEM results suggests that the current state of entrepreneurship in Slovakia can be briefly characterized, on the one hand, by above-average entrepreneurial activity of our population in comparison to countries that are our benchmarks, and, on the other hand, by an entrepreneurial environment whose key characteristics are below-average. Such a state is clearly unsustainable, and will be reflected in the gradual decline of the entrepreneurial activity, which is already evident in the inter-annual comparison of 2012 and 2011. These circumstances will also be reflected in the decline of the aspirations of our entrepreneurs and the associated negative impact on economic growth and development of the country.